When OnLive announced the release of OnLive mobile on December 8 of last year, they also teased us with the upcoming touch controls for Rockstar's hit detective game L.A. Noire. Back then, OnLive stated that they are working on the touch controls together with Rockstar Games and that the touch controls will be available soon. Well, they said the same about the OnLive App for iOS and we are still waiting for it, because it's still in Apple's approval limbo. At least, the day has come that OnLive has released the promised touch controls for L.A. Noire, though about 3 months late. 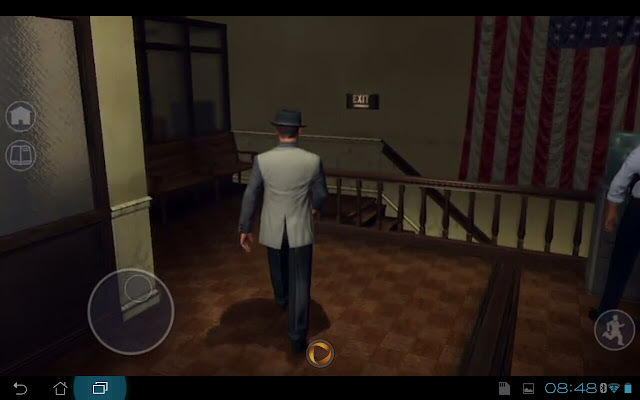 You can now play L.A. Noire via touch controls on your Android tablet or smartphone by just downloading the free OnLive App for Android and sign up for free at OnLive in the US or UK. The touch controls are a lot like the iOS and Android versions of Grand Theft Auto III, with all the same little touchscreen buttons for entering and exiting vehicles, turning on your siren, sprinting and so on, a virtual analog stick when you start walking, and swiping just about anywhere else to move the third-person camera. There are also additions, though, like a button for your journal, and you can indeed use your fingers to manipulate evidence. There doesn't seem to be any way to change the position or size of those touchscreen buttons. The genius of the touch-optimized version of the game is that it has indeed been retooled for touch; context-aware buttons appear, such as an accelerator and brake pedal during the driving sequences. Fortunately, the game doesn't require you to careen all over the city, a la a similar game, Mafia II, so that any imprecision in the controls won't necessarily negatively impact your gaming. Give OnLive and Rockstar Games credit: the controls have been intelligently thought out, where users simply need to walk using a virtual joystick, but swipe to change the camera angle. An OnLive button in the lower center of the screen brings up the OnLive dashboard. 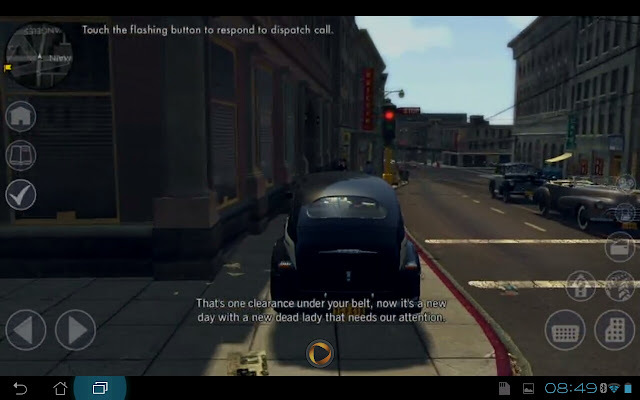 "L.A. Noire primarily uses gesture controls and a brand new UI system specifically for the OnLive version of L.A. Noire, which differentiates the game from others offered on OnLive's virtual pad," stated OnLive. "If you haven't tried console-class gaming on your tablet, we have 25 more touch-playable OnLive games on the service that you can demo free," said OnLive Founder and CEO Steve Perlman. "Some of these games have been specially redesigned from the ground up to support touch controls, others have various forms of virtual gamepads right on the screen, and there are nearly 200 more that can be played using our Universal OnLive Wireless Controller. One thing unifies them all: ridiculously high-performance games that have no business running on a tablet, but utterly redefine the tablet experience." 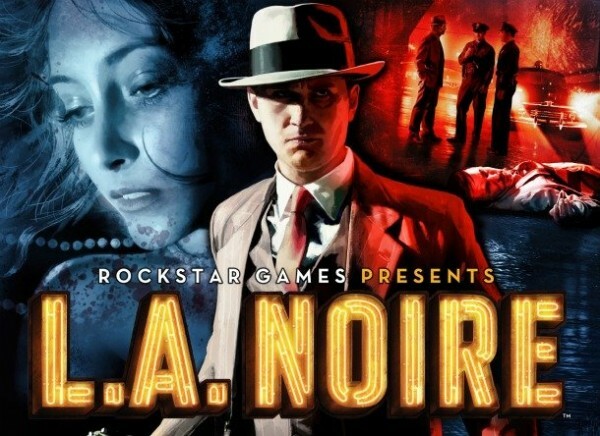 L.A. Noire is published by Rockstar Games and was developed by shattered game studio Team Bondi. The porting of L.A. Noire to the PC and OnLive was handled by Rockstar Leeds. The story of L.A. Noire follows Cole Phelps amid the post-war boom of Hollywood's Golden Age. He is an LAPD detective thrown headfirst into a city drowning in its own success. Corruption is rampant, the drug trade is exploding, and murder rates are at an all-time high. In his fight to climb the ranks and do what's right, Phelps must unravel the truth behind a string of arson attacks, racketeering conspiracies and brutal murders, battling the L.A. underworld and even members of his own department to uncover a secret that could shake the city to its rotten core. Sadly, L.A. Noire still doesn't feature a demo on OnLive. Another unfortunate omission for L.A. Noire is, that two big OnLive features, namely gameplay spectating and Brag Clips have been disabled at the request of the game publisher Rockstar Games. Upon launching the game for the first time, users will be presented with the following prompt: “To avoid giving away plot twists and spoilers, spectating and Brag Clip videos have been disabled by request of the publisher.” I don't think this is such a smart move by Rockstar, they should have let the gamers decide if they want to see others playing or not. I hope that Rockstar rethinks this decision and lifts this ban. L.A. Noire doesn't include the L.A. Noire DLC bundle. The game is priced at $29.99 in the US ($20.99 PlayPack) and £19.99 in the UK (£13.99 PlayPack). The rental prices are $5.99 for 3 days ($4.19 PlayPack) and $8.99 for 5 days ($6.29 PlayPack) in the US. In the UK the rental prices are £3.99 for 3 days (£2.79 PlayPack) and £5.99 for 5 days (£4.19 PlayPack). You can rent and buy L.A. Noire for the US powered by OnLive. You can rent and buy L.A. Noire for the UK powered by OnLive. You can buy the L.A. Noire DLC Bundle for this version of the game. It costs $11.99 in the US ($8.39 PlayPack) and £8.99 in the UK (£6.29 PlayPack). L.A. Noire: The Complete Edition already includes the L.A. Noire DLC bundle. It is priced at $39.99 in the US ($27.99 PlayPack) and £24.99 in the UK (£17.49 PlayPack). You can buy L.A. Noire: The Complete Edition for the US powered by OnLive. You can buy L.A. Noire: The Complete Edition for the UK powered by OnLive.